Today, kitchens aren't just for cooking. Open concept layouts are found more and more in homes, and are opening the kitchen up to the whole family. Interior Design By: Evelyn Eshun of Evelyn Eshun Design, Inc. Whether it's a quick breakfast on the way out the door or a family game night, a kitchen plays so many roles in your daily life. For this reason, when you are designing, updating or redecorating a kitchen, you want to think of all the ways that the space will be used. 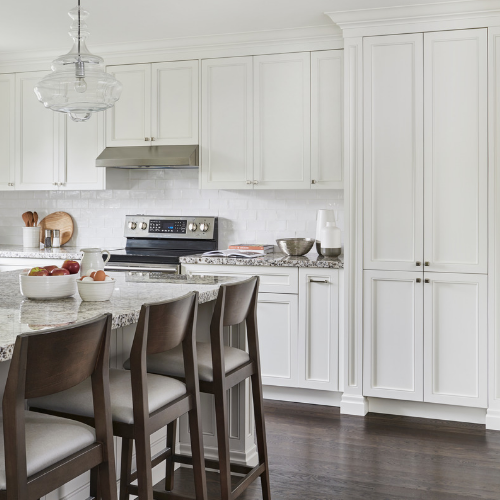 From a desk for organizing bills and family schedules to a large table for family dining, game night or school projects, Catherine-Lucie Horber made sure her kitchen design, pictured below, would leave the space ready for whatever her client's family needed. Pictured above, designer Evelyn Eshun chose to visually blend the lower cabinetry with the hardwood flooring creating an even more expanded feel to her client's already spacious kitchen concept. In large open concept kitchens, area rugs can add character and help absorb sound. Comfortable stools, a spacious island and task lighting draw the family in for a leisurely breakfast, afternoon snack or as place to simply relax and chat. The below kitchen, designed by Kris Bridgen provides a feeling that's equally as open as it is warm and comforting. Interior Design By: Kris Bridgen of North Muskoka House Ltd.